International flight booking has became a lot easier these days with the help of online travel portals. We had a time where we see the air transportation as a wonder. If we notice, we can observe that at least one person from each Indian family who travels internationally for different purposes. In the beginning, air transportation was mainly used for International journey and international fight booking was higher than domestic. The number of international air travelers and airline ticketing for international sectors are increasing day by day due to globalization, Foreign Direct Investment (FDI), international tourism, lack of time to depend on other travel facilities like ship etc., International business, increasing number of expatriates and travel writing etc. Few years back the situation was different, people used to depend on ships for intercontinental travels and it was more time consuming. It took weeks and months to reach in the destination. In this busy living schedule people do not have that much time and patience to spend, so people began to choose flight traveling as it is time efficient. These days the number of leisure travelers is also increasing as we have a large number of people who have a lot of disposable income. Efficient and skilled tour operator, travel agent or airline personnel convert these types of prospective customers in to clients. Now a day's people have much enhanced earning and they are capable and willing to spend for comfort and leisure activities and Airlines are offering tickets in cheap rates and offering deals more regularly because of the tight market and competition. This is also one of the reasons for increased International flight booking. With the help of travel portals and mobile apps, we can book airline tickets more easily that early days, this avoids the searching for travel agents in your city, and going to their agency to manually book the tickets and paying in cash. Online portals allows you to pay using credit cards, debit cards, cash cards etc. we at akbartravels.com also offer EMI for booking tickets which is more convenient since you can book your flight now and pay in easy monthly installments. akbartravels.com also have customer support teams / travel desk in selected airports to assist you with the ticketing and boarding process. In 1946 Tata Airlines became a public Limited company under the name Air India. After independence Govt. of India acquired 49% of shares of Air India with the agreement of purchasing an extra 2% share. On June 8 1948 it started the international services from Bombay to London Heathrow Via Cairo and Geneva under the name Air India International. After few years various airlines from India and abroad started operating international services from India and return. Some major International airlines are listed below. 2. Select from and to cities and departure and return dates (If it is a round trip) and click search button. 3. Chose the appropriate airline of your choise. 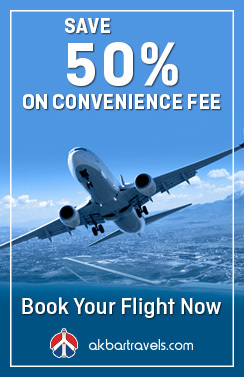 4. Review the flight details and fares. 5. Enter traveler details, passport details, contact details and make payment. You have to carry your passport, Visa and medical certificate if required. Hand baggage and check-in baggage dimension and weight should be according to the flight rules which you are going to travel. The products such as knife, lighter, matchbox, certain chemicals etc. are not allowed to carry for security reasons as per Dangerous Goods Regulations Act (DGR). Check in should be done minimum 3hrs. prior to the departure time.